A big hit with my bunco group. Since our May bunco fell the day before Cinco de Mayo we were asked to bring a Mexican themed food. So I did, in dessert form. Everyone loves tacos, right? We were married when my husband was in his last year of college and I remember we would go and buy tacos for 25 cents each. Were they ever good! And I always served tacos to my kids when they were still at home. What’s not to love — crunchy shell, spicy ground beef filling, some shredded lettuce, tomato and cheese with a spicy taco sauce drizzled over the top. Have things ever changed. My first fish taco was in LaJolla, CA at a place called George’s at the Cove and since then I have become a taco aficionado. Experimenting with all kinds of fillings, I have made a Pork Belly Taco, Pulled Pork Taco, Fish Tacos, and one of my favorites, Grilled Salmon Tacos with Schirarch Cream. So, you see I have been experimenting with a lot of things other than ground beef; so why not a dessert version. A few years ago a friend told me about this bed and breakfast she went to in California, the Oak Knoll Inn in Napa (Looks like the Inn has been sold, shucks, we never made it there.) and how beautiful the food was and the owner had a Chocolate for Breakfast Cookbook by Barbara Passino. The book is full of wonderful breakfast items and many, many chocolate recipes. 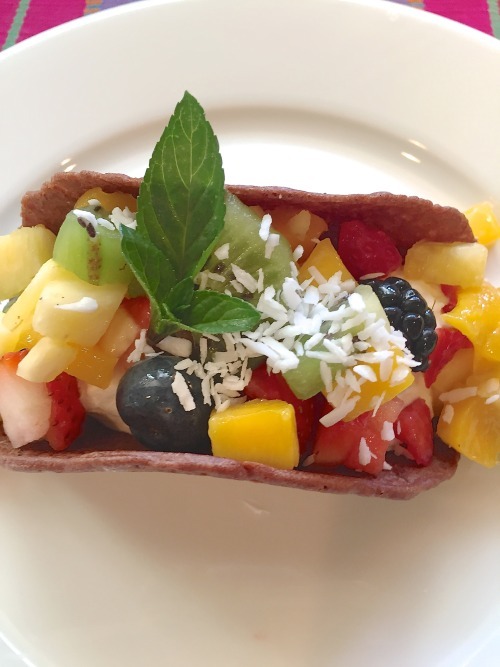 I fell in love with a chocolate taco picture (is that possible?) 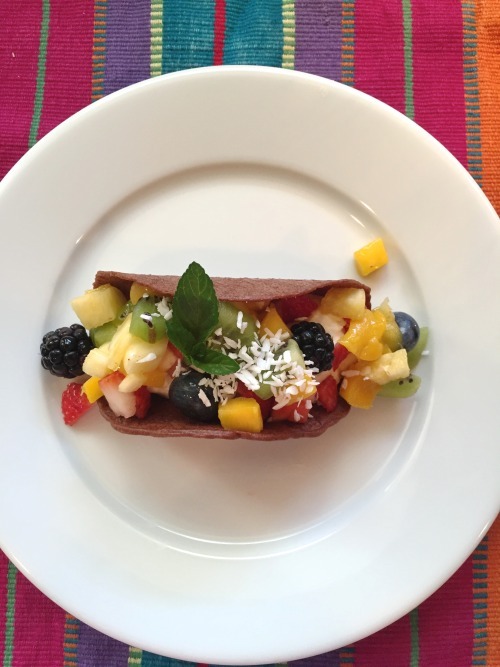 of a taco full of fruit and topped with a pansy and a big scoop of raspberry sorbet. I used Barbara’s recipe for the taco shell minus the cayenne pepper. My taco has a cream filling and then I chopped my fruit up small since my shells were on a smaller scale. A krumkake iron was used to make the shells and it worked just great. After cooking each shell, they are draped over a rolling-pin to cool and crisp up. For the cream I just mixed some cream cheese, powdered sugar, whipped cream and some Solerno blood orange liqueur and then topped with chopped fruit and mint and coconut. The coconut was supposed to resemble the cheese you put on top of a taco. 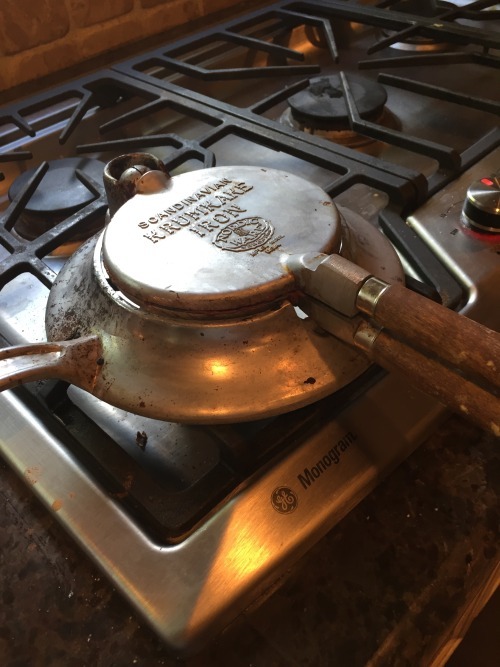 Barbara suggested cooking the shells in a crepe pan which I had but I wanted the designs on the shell that the krumkake iron makes when the batter is pressed and cooked. Hope you will try this and who couldn’t use another kitchen gadget? I’ve had mine since the 70’s. BLAST FROM THE PAST: You know how much I love shrimp and this Hawaiian Coconut Shrimp with Orange Marmalade Sauce is going to make you want to run out and buy some shrimp. Isn’t it beautiful. And it as delicious too. 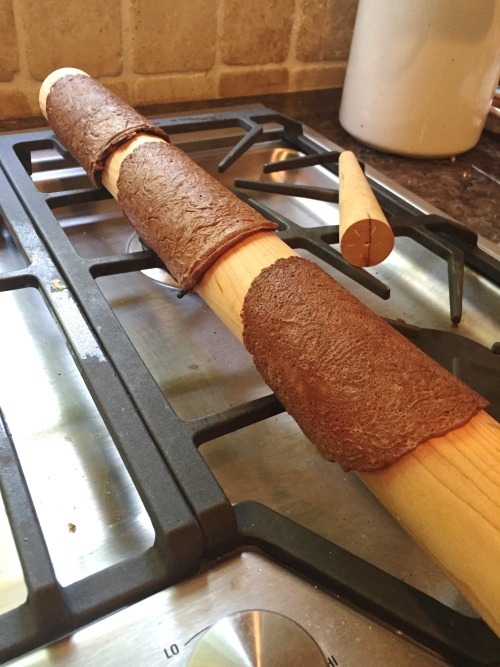 This is what a krumkake iron looks like. You need one because you can even make ice cream cones and cannoli shells with it. I do have some cannoli shell forms but I need to try this iron to make them because it would eliminate frying of cannoli shells. After cooking the shell for a few minutes (about 2-3 minutes total) drape the shell over a rolling-pin until it cools and makes a beautiful embossed shell. This is what it looked like cooking in a crepe pan. I don’t think I had enough batter because I couldn’t get it to spread and fill the pan. Chop up all your fruit and refrigerate until ready to serve. Add a couple of cups of powdered sugar to these ingredients and some vanilla. Meat the room temperature cream cheese with the powdered sugar until smooth and creamy. Add in the solemn and vanilla extract. Fold in the whipped cream and refrigerate until ready to serve. 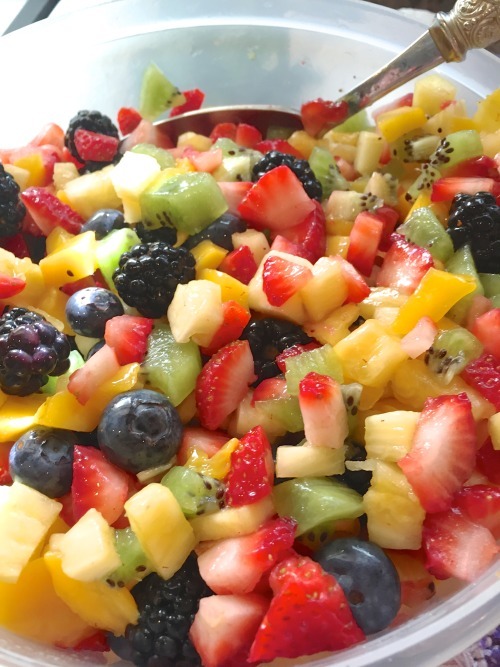 Pile on the fruit and top with a mint leaf and some coconut. For the taco shells: Place all the ingredients in a mixing bowl and beat until smooth with an electric mixer. Cover the batter and place it in the refrigerator to chill for at least 2 hours or overnight. To cook and shape the tortilla: (I used a krumkake pan) Remove the batter from the refrigerator and allow it to come to room temperature, which will take 20-30 minutes. 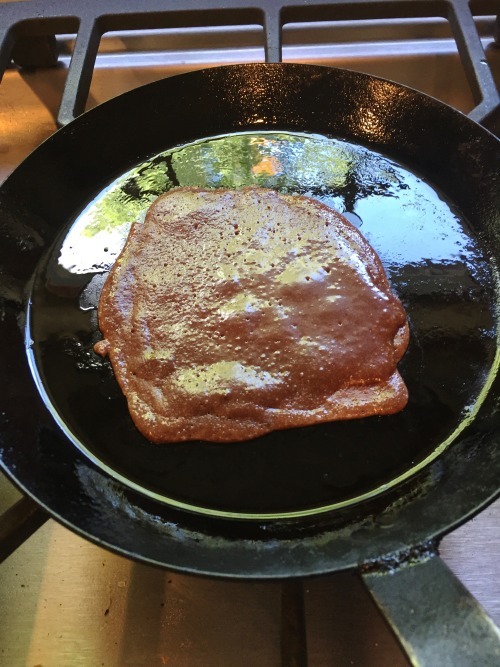 heat a small skillet or crepe pan over low heat. 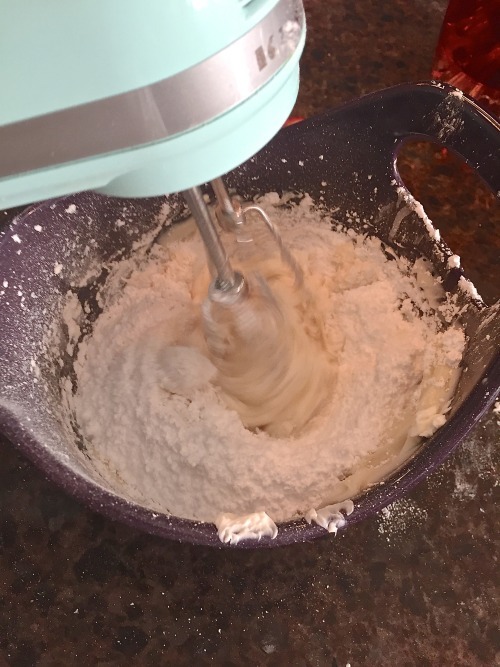 Pour in a little less than 1/4 cup of the batter and tilt the pan quickly to spread the batter into a 6" circle. Once the edges look dry (2-3 minutes), loosen the edges with a knife and turn over the tortilla. Cook for another minute or two. Life the soft hot chocolate tortilla out of trepan with a knife or spatula and quickly drape it over a rolling pin. (I held down the edges until it held the shape -- if it doesn't then it didn't cook long enough.) 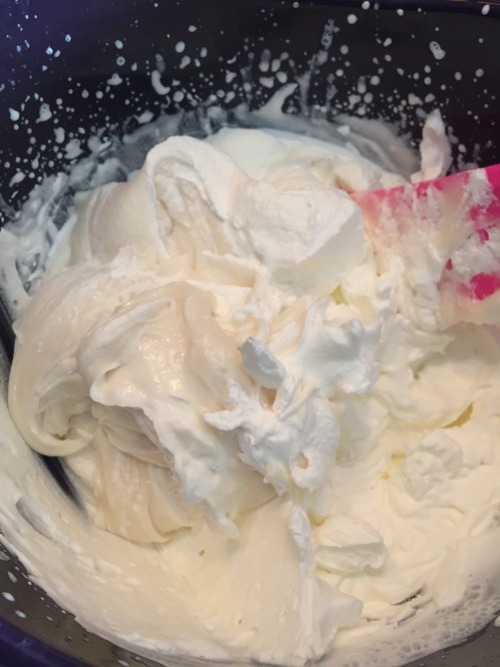 It will become firm and crisp as it cools. .
For the filling, beat the room temperature cream cheese until it is soft and slowly add in the powdered sugar, vanilla extract and the Soreno liquer until smooth and no lumps. 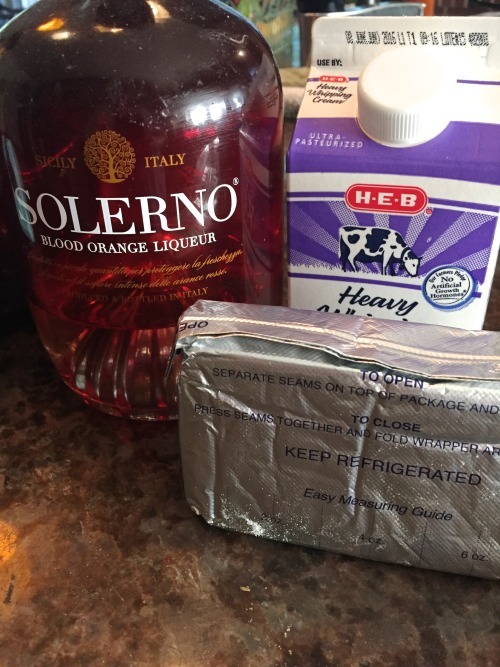 Fold in the whipped heavy cream and mix until combined. Refrigerate until ready to serve. For the fruit: chop all fruit into small pieces or if you have a bigger taco shell you can cut larger. 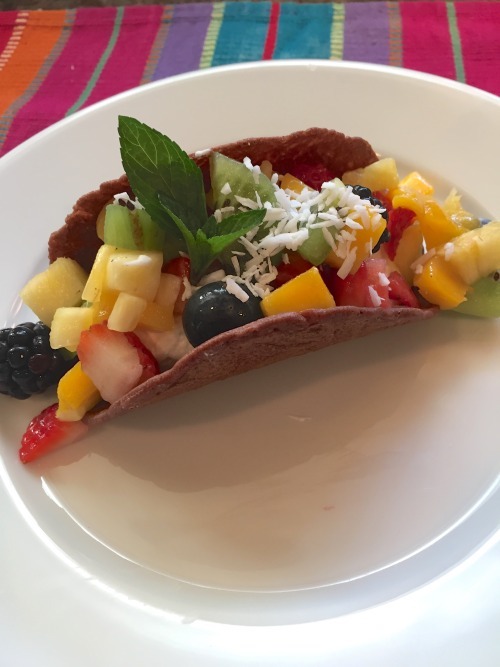 When ready to serve, take one taco shell, add about 2 tablespoons of the filling to each shell, heap on the fruit and add some coconut and mint for garnish.